SECONDS FROM DEATH: This screen grab, taken from CCTV video posted to social media, shows Shervon Medina walking along the pavement off the Diego Martin Main Road on Tuesday night moments before she was knocked down and killed by a car driven by an SRP. This was how president of the Police Social Welfare Association (PSWA) Ag ASP Michael Seales described the death of an Arima woman who was knocked down by a car driven by a Special Reserve Police (SRP) officer on Tuesday night in Diego Martin. 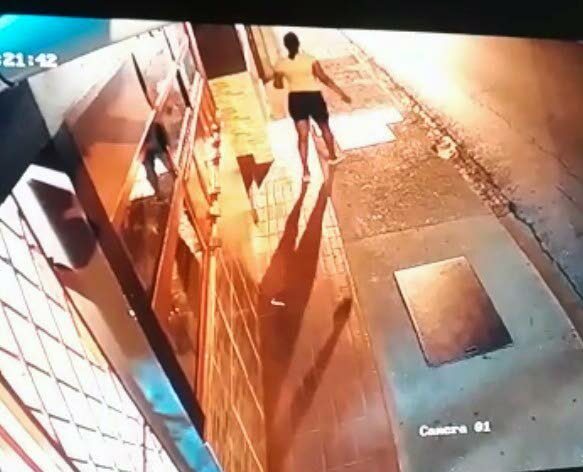 Closed-circuit (CCTV) video showing Shervon Medina, 46, walking along the pavement off the Western Main Road and then being mowed down seconds later by a car which veered off the road and mounted the pavement towards her, have since been posted online and gone viral. The incident is said to have taken place at 8 pm and Medina died minutes later at the St James medical centre. The driver is said to have stopped a short distance away and in the video footage, is seen being led away for medical treatment by officers who arrived on the scene. Commenting on the incident, in an interview carried ‘live’ by radio station i95.5FM, in its midday news broadcast yesterday, ASP Seales said: “The association finds it so unfortunate. Our hearts goes out to the relatives who have been severely affected because of this incident. When you look at the video that is circulating on social media, it appears to have been an atrocity. Police sources said that there was a suggestion that the SRP may have been drag-racing at the time but this was not confirmed. Police said that the SRP’s car may have hit another vehicle which caused it to swerve onto the pavement. The driver was up to press time warded in a stable condition with a headache and body pains. “Just yesterday I was talking to a senior officer and you know, talking about the whole question of motor manslaughter is still available on the law books and we have gone past eight years where nobody would have charged anyone for motor manslaughter. “So there are a lot of things that is happening that the association is disheartened about in terms of what has happened in relation to this accident,” Seales said in the i95.5FM news report. He added that he was concerned about the public’s perception based on how police officers who were first responders would have removed the driver from the scene. “Removing him from the scene, yes they can do that, but the whole question of the way the public has already perceived it I think that is not what the association wants for its membership. The association wants for its membership where, persons can say, ‘listen, the police officers who arrived at the scene, as first responders, acted beyond reproach and dealt with it in the most professional manner even if it is against one of their own’,” Seales said. While confirming that an SRP is assisting police in their investigations, Seales could not state if that person was in actual police custody. He also said the association could not be certain if the accident took place because of drag racing. For her part, Arrive Alive president Sharon Inglefield encouraged drivers to take defensive driving classes and learn the regulations and laws of the road. She is also hoping that the reformed Fixed Penalty and Demerit Point System will cause errant drivers to lose their licenses. She said the new system would track the behaviour of drivers and demerit them for reckless driving. She added that if drivers continue to driver recklessly, the law could suspend or even take away drivers’ permits altogether. “Our justice system must hold reckless drivers accountable, particularly our law enforcement officers who may be driving without due care and attention and causing death by dangerous driving,” said Inglefield. “Our law enforcement officers need to be of impeccable character in every way, to include responsible driving behaviour. Good role models are necessary, especially at this time, with the increase in road crime. Zero tolerance must be demonstrated in every aspect,” she added. Police sources said that the SRP is officer within the police’s Emergency Response Unit (ERU). Efforts to reach Commissioner Griffith for a comment yesterday proved futile as calls to his cellphone went unanswered.